Chris Atherton (and more about her here) has a great blog post on how to give a presentation that keeps your audience’s attention. It’s from the angle of student presentations (she’s a college lecturer), but the points apply to any presenter. 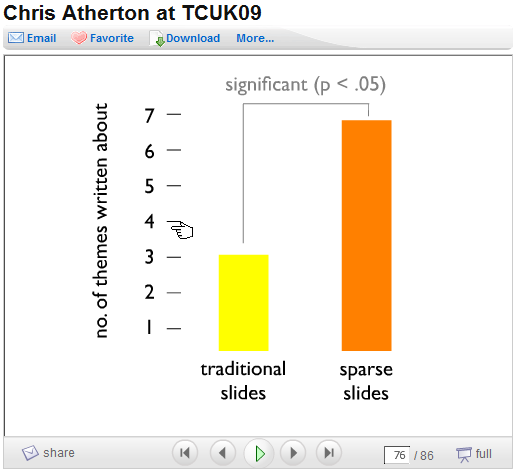 Dr. Atherton also did research comparing slides with significant bulleted text and those with little text. Students were tested on the material. In multiple-choice tests, there was no difference, but in short essay tests, students who saw what she calls “sparse slides” did twice as well. You can see Dr. Atherton’s slides on slideshare, but they aren’t fully comprehensible without the presentation she gave on the subject.You can read a good write up in Olivia Mitchell’s blog. 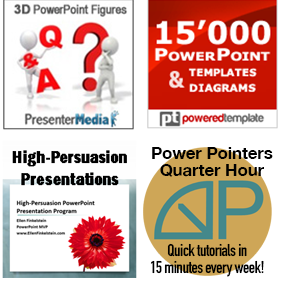 Even for business presentations, you want your audience to understand and remember what you say! So, what do you do? My Tell ‘n’ ShowSM method shows you how to create slides without bullets. Not only is it easy, your slides will look so much better. And you’ll gain more success meeting your goals, whatever they may be. Just use a slide title and illustrate that point with an image, chart, diagram, table or map. You can do it! Banish bullet points forever! Why do you change for the better?